There are many ways in which the workplace can influence an employee’s choice of transportation for their daily commute. Examples of tools include preferential parking for carpools, a discounted monthly bus pass through EcoPass, secure bicycle parking, or an Emergency Ride Home program, among other options. Policies, programs, infrastructure, and promotion are all important aspects of a comprehensive approach. But there may be other reasons why an employee does not change their behaviour even when presented with these options. To help individuals move beyond inertia or simple habit to change their travel behaviour from driving alone to more sustainable modes, Green Action Centre has developed Smart Trips — a program that combines elements of individualized marketing and the Commuter Challenge. Why combine these two programs? Individualized marketing is a best practices approach that has proved to be effective in helping individuals switch at least some trips from driving alone to riding the bus, carpooling, cycling or walking. It’s been used extensively in Europe and Australia, and more recently in North America, including Winnipeg (Community-Based Travel Marketing Pilot Project). The annual weeklong Commuter Challenge in Manitoba and across Canada, in which participants log their ‘green’ kilometres travelled, has demonstrated the positive benefits of raising the profile of green commuting and getting people to think daily about their transportation choices. Studies show that tracking daily progress increases a person’s likelihood of living up to a commitment to change behaviour. The fuel savings are extrapolated to let them know how much they would save over the year if they maintained that same commuting behaviour. Feedback on their personal results helps to show how small changes can really add up! Tools such as the individual’s choice of a bike light and reflective ankle strap, pedometer, week’s worth of transit tickets, or an umbrella serve as further motivation to try a new mode of travel or be rewarded for their green commuting choices. Sometimes it can be as simple as holding an employee’s parking spot on reserve while they try transit for a month to see if it works for them. 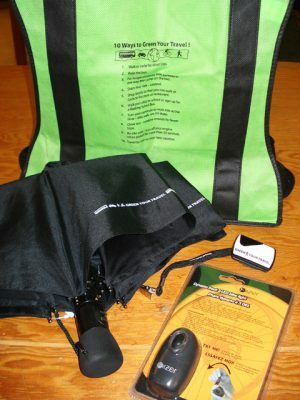 Personal assistance and resources are also made available through Green Action Centre, such as a bike map or bus pass holder/route schedule, help planning a bus trip using Winnipeg Transit’s online trip planner (Navigo), a presentation on commuter cycling gear or bike maintenance, or individual assistance to discuss and try to address barriers. The key is to engage and connect with the employee in response to their specific issues. Depending on the workplace’s needs, evaluation of the results can range from a basic profile of commuting habits completed at the start and a simple questionnaire at the end of the program, to a more detailed survey with quantifiable results at the program start and finish. Check out the results from the 2010 Summer Smart Trips pilot project. To explore running a Smart Trips program at your workplace, contact [email text=”Beth McKechnie”]beth@greenactioncentre.ca[/email] or [email text=”Jessie Klassen”]jessie@greenactioncentre.ca[/email] at (204) 925-3772.